On December 5th, 2018, the Stern Energy and Infrastructure Club (SEIC) and Stern Private Equity Club (SPEC) co-hosted a panel discussion on the current state of private equity investment in infrastructure. Attendees were privileged to hear from panelists Jamie Anderson, Principal at AECOM Capital; David Giordano, Head of Renewable Power Americas and APAC at BlackRock; Hillary Higgins, Vice President at Brookfield Asset Management; and Bobby Jahani, Senior Associate at Macquarie Infrastructure and Real Assets. The panel was moderated by Professor Paul Tice of NYU Stern. Topics discussed included the growth in private equity infrastructure investment; how different investors define “infrastructure” as an asset class; how fees structures in the industry are changing; and how tightening credit markets will impact infrastructure financing. Earlier this month, Rob Glen (MBA ‘99) joined current MBAs for lunch to discuss the state of global energy markets. Rob is the Western U.S. Market Leader at Bloomberg New Energy Finance (NEF). Rob presented Bloomberg NEF’s current outlook on transitions and opportunities in the energy industry, focusing on trends in clean energy investment. Following the presentation, Rob asked students for their thoughts regarding the direction of the industry, prompting interesting discussions about energy policy, electric vehicles, and corporate social responsibility. SEIC would like to thank Rob Glen for visiting campus again to speak with us! Moderated by NYU Stern faculty member and SEIC sponsor Paul Tice, the panel covered topics including trends in the power sector affecting markets and firms, strategies for pursuing energy careers from Stern, and the best classes to take. SEIC would like to thank each of the panelists and Professor Tice for their time and guidance, which was appreciated by students. On April 11, the Stern Energy & Infrastructure Club hosted Mike Sibilia, CFO of LaGuardia Gateway Partners, to discuss both his involvement in the major upgrade at LaGuardia International Airport and his career in the fields of real estate and infrastructure development. Before an extensive Q&A session, Mr. Sibilia walked the audience through the complexities of Public Private Partnerships and how they can be applied to major infrastructure upgrades like LaGuardia’s current project. The Stern community was delighted to have him spend the evening with us. The event also bore a great deal of significance for the club because it’s the first event dedicated solely to the business of infrastructure development since the Club rebranded (from Stern Energy Club) this past year. The discussion marks the beginning of what will be a number of informative events on the future of infrastructure improvement. 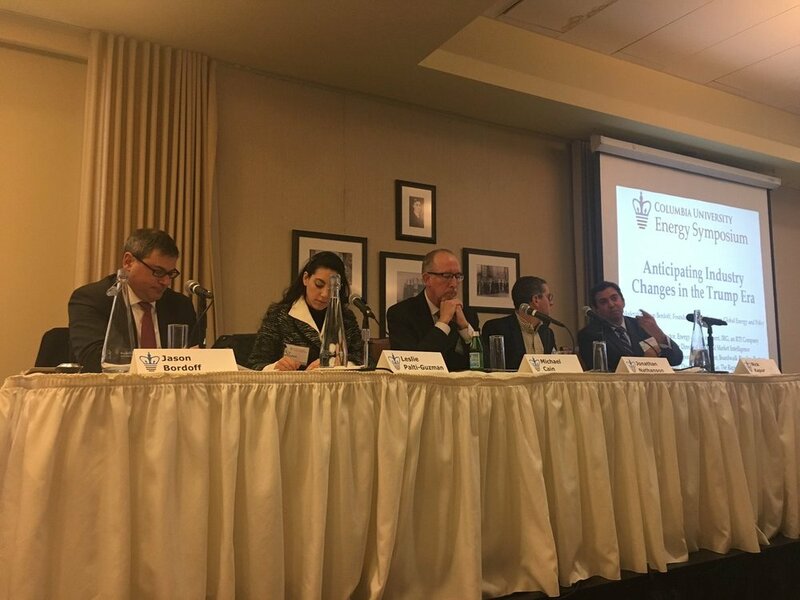 The Stern Energy & Infrastructure Club hosted a panel discussion of "Batteries and Electric Vehicles: The Future of Mobility and Energy Storage" on April 24th, 2018. Panelists included Stern alumni from Bloomberg New Energy Finance and EOS Energy Storage, as well as experts from Tesla and the Natural Resources Defense Council. The discussion focused on the state of battery storage and electric vehicle markets and technologies, along with the way forward for public and private stakeholders in the sector. The conversation also covered the status of battery and electric vehicle deployment in emerging markets and the viability of different battery technologies for vehicle and utility-scale applications. 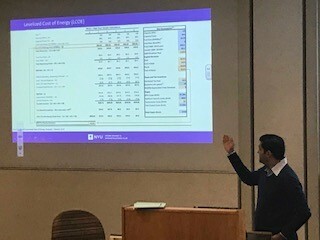 On April 4th the Stern Energy and Infrastructure club hosted Kevin Chang, Vice President at Credit Suisse, for a seminar on the financial modeling of power generation projects. 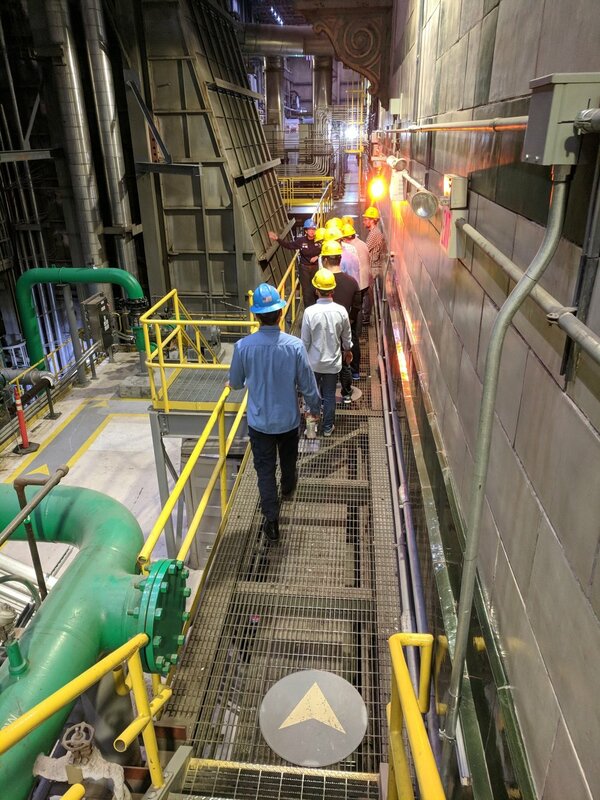 Kevin led a discussion of the market factors impacting a sample power generation project and demonstrated how to build a basic financial model of the project. The Stern community was delighted to have him spend the evening with us. The club would like to thank Kevin Chang for leading the session. On February 1, SEIC members Gideon Banner, Guy Brearey, Brett Gallagher, Jonathan Kienzle, and Ryan Wall competed in the 3rd Annual Columbia University Energy Symposium Case Competition. This year’s case addressed an issue facing many small communities: grid resilience, and the opportunities and challenges of meeting that issue with a microgrid. The Stern team – named “Transmission Critical” – was tasked with determining not only the financial implications of a microgrid investment, but also how to address the concerns of the many different stakeholders involved. After applying with a response to a short mini-case (dealing with community solar), the NYU team was selected as one of 14 teams from top-tier schools from across the country. The team presented its solution to a panel of judges from firms such as NRG and Booz Allen Hamilton. Despite not advancing to the final round of presentations, the team saw the competition as an excellent opportunity to learn about the wide variety of challenges associated with implementing a successful microgrid project. Most importantly, everyone was glad to have the chance to represent both NYU Stern and the Energy and Infrastructure Club with pride. The Stern Energy & Infrastructure Club hosted an Energy Finance Panel on the evening of November 20th, 2017. Panelists included Stern alumni from Barclays, Goldman Sachs, and GE Energy Financial Services. This year’s discussion focused on macroeconomic trends within the energy industry, including the impact of depressed oil prices, low interest rates and the role of capital markets. The conversation included interesting insights around the evolving energy landscape and each panelist’s concerns regarding potential future risks. The speakers also discussed their views on the role of Private Equity within the Infrastructure space and changing investment profile of future projects. Come join us and get to know some of our members and learn more about the Club! Drink tickets will be provided. Please join us to hear more about the SEIC and everything we have planned for the year, including events, case competitions, and treks. We'll also be outlining available AVP positions. We look forward to seeing you there! Professor Emeritus Ingo Walter and Professor and Executive-in-Residence Paul Tice will be teaching a 1.5 credit class in the second half of the fall 2017 semester that will focus on the infrastructure and project finance market, one of the most dynamic and challenging areas of global financial architecture. The course with provide students with an introduction to this expanding and rapidly-changing sector, and an understanding of the myriad risks involved in developing large-scale infrastructure projects around the world. This event will serve as an introduction to students interested in learning about the course. During this session, Professor Tice will briefly touch on infrastructure requirements and risks, outline the contours of the project finance markets, and then dive into a live energy project deal. On February 2, 2017, three first-year MBA students (Gideon Banner, Zach Karson, and Ryan Wall) presented their case at the 2017 Columbia Energy Symposium Case Competition. Other schools competing included MIT, Bard, Colorado School of Mines, Carnegie Mellon, and Columbia. The case centered on a business proposal for a virtual power plant (VPP), a new grid structure involving a combination of solar, storage, and demand response integrated and aggregated to manage grid instability, peak load, and state-level renewable energy requirements. On a larger level, the case aimed to develop answers the question of whether state regulators and utilities (in this case, a vertically integrated one) should seek to get ahead of the curve of industry change, and if so, how best to do so. This tied into the larger them of the conference: “Disruptive innovation: The New Status Quo?” A number of notable speakers addressed this theme, including Mary Powell (CEO of Green Mountain Energy), David Crane (former NRG CEO), and Jigar Shah (from the Energy Gang podcast), among others. 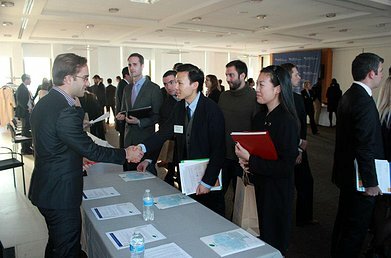 Other notable highlights of the conference included a career fair and venture showcase; a number of Stern MBAs were in attendance for both.